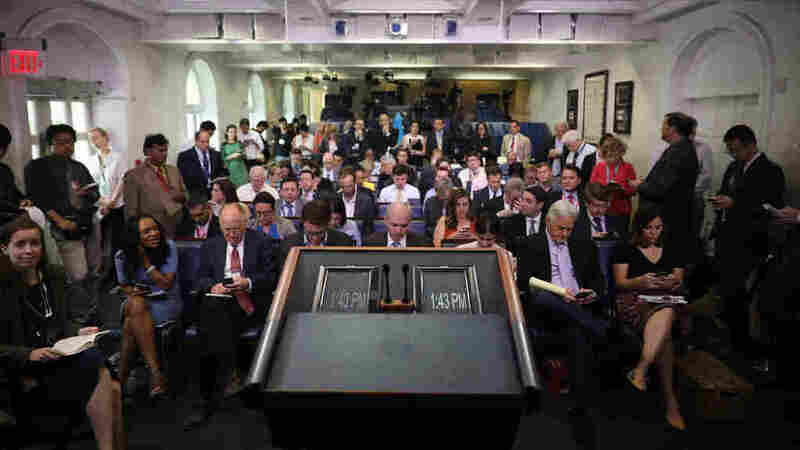 Opinion: Calling The Press The Enemy Of The People Is A Menacing Move This week President Trump continued his campaign to delegitimize the news media, using a particularly ignominious phrase. Reporters wait in the James Brady Press Briefing Room at the White House on June 23, 2017. But Sarah Sanders, the White House press secretary, pointedly declined the chance this week to say, as Ivanka Tump did, "I do not feel that the media is the enemy of the people." We should be careful about calling President Trump's attacks on the press unprecedented. Abraham Lincoln shut down newspapers during the Civil War. President Wilson signed the Espionage Act that made it illegal to print, "any disloyal, profane, scurrilous, or abusive language about the form of government of the United States," which would put many Americans behind bars today for a tweet. Richard Nixon had journalists on his enemies list. President Obama's Justice Department used Wilson's old Espionage Act to prosecute government whistleblowers. But in this age of trolling, public profanity, and angry, frothing crowds who harass reporters at rallies and sputter coarse slogans, there is something menacing about a president of the United States who cheers on mobs and brands a free press, "the enemy of the people." I am not starry-eyed about the news business — and it is a business. A lot of us got into journalism with a high-minded ambition to inform the American public. But I think a lot of us make it a living because it's gratifying and fun to try to find and tell stories, see history in the face, ask sharp, critical questions of people in power, and tell the stories of people who feel overlooked. A free press is the fresh air you need to keep a democracy breathing. But journalism, as this president, who became a media celebrity because of the New York tabloids should know, can be a contact sport. Civility and professionalism are welcome. But reporting is the profession of All The President's Men, not Mary Poppins. Its purpose is to find flaws, raise doubts, discover secrets and air differences. If the president had called reporters nosy, cranky, contentious, or smart-alecky, many reporters would have laughed and agreed. But calling them — us — enemies of the people is the kind of curse made by tyrants.